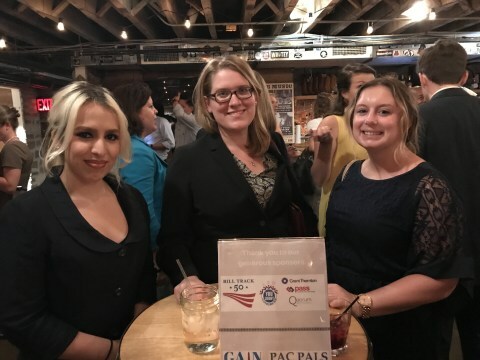 The Government Affairs Industry Network (GAIN) was thrilled to partner with PAC PALS and You Lobby Congress to host a well-attended networking event complete with congressional trivia on July 20, 2017. This “Third Thursday” event was a stellar success, and delivered a unique opportunity for attendees to connect with new people over the promise of winning the trivia game together. While some chose to mingle over the delicious beverages provided by Hill Country and our generous sponsors BillTrack 50, You Lobby Congress, Grant Thornton, PASS, and Quorum, others dove deeply into the competitive spirit as they clawed their way to victory. “I demand a recount!,” was the resounding cry from the team who was all-too-correct that they had, indeed, won top prize. GAIN is excited for our next “Third Thursday,” which will be held on November 16. We are honored to continue our charitable tradition of supporting charity as we prepare for the holiday season, and encourage our network to widely attend and share this invitation. Stay tuned on GAIN social media for the chance to vote on which DC-based charity we should support. Details to be released in the coming weeks. Thank you to all the event organizers and sponsors, and most importantly our network, both loyal and new, for their continued support. We enjoy Inclusively Connecting DC with you!